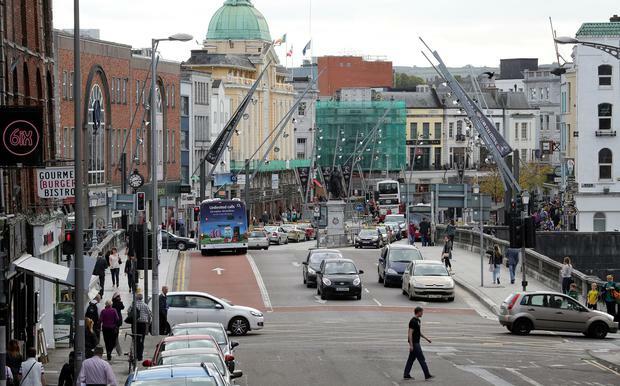 A FORMER Lord Mayor of Cork expressed outrage after someone defecated on St Patrick's Bridge just 48 hours after its major €1.2m refurbishment was officially unveiled. Councillor Chris O'Leary was walking to work yesterday morning when he spotted the large pile of human excrement by the refurbished stone balustrade on the middle of the bridge. The individual, having defecated, then appeared to have smeared the excrement all over the cleaned stonework. "I just could not believe that someone could publicly have a c*** on the newly restored St Patrick's Bridge," Councillor O'Leary said. He posted photographs of the offending scene on social media - and also underlined his anger at what the person had done. "What kind of person would do such an offensive thing," he asked? "I hope CCTV caught them in the act." Council workers were scheduled to attend the scene to clean up the mess. The 158-year-old bridge was the centrepiece of Cork's St Patrick's Day festival programme to celebrate its lavish refurbishment which included the repair and re-installation of its Victorian-style street lights, the cleaning and repair of all its stonework and the installation of new footpaths and road surfaces. Gardaí are now understood to be studying CCTV security camera footage from the area. A number of complaints over the incident have been received.